Kosher Candy Buffets – Australia’s Only Kosher-Certified Candy Buffet Company!! Looking for fabulous Kosher catering that is both new and impressive? The Candy Buffet Company is a Kosher-qualified supplier that can provide your event with a beautifully crafted Kosher candy buffet. We provide both parve and milchig selections of candy based on your request. Our candy buffets can be themed to complement any Bat Mitzvah or Bar Maizvah, no matter how eccentric or left-field your ideas may be. 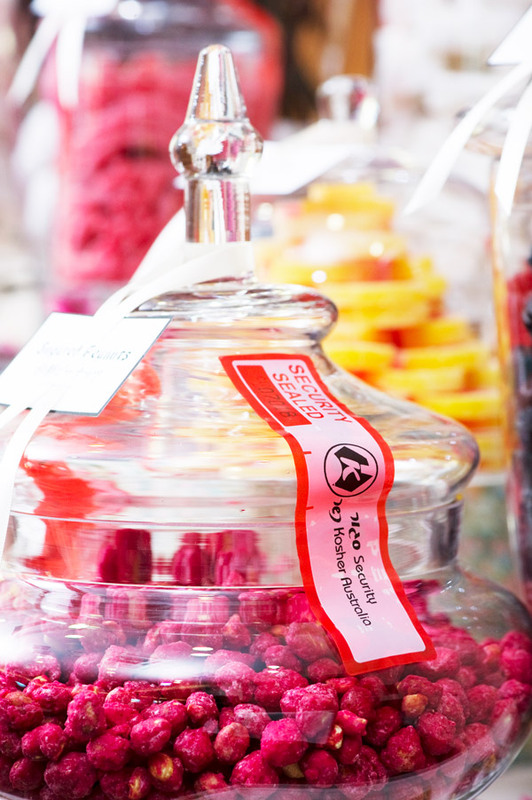 A candy buffet is bright, colourful and always a talking-point for all your guests for months, if not years to come. We can provide a Mashgiach or work with yours. A Kosher candy buffet is well suited to both weddings and also Jewish holidays including Tu Bishvat, Purim, Pesach, Lag B’Omer, Shavuot, Tisha B’Av and Rosh Hashana. For weddings, we can colour coordinate your candy buffet to match your wedding colours, bridesmaids, venue and more. All our Kosher candy buffets are inspected and sealed by what is widely recognised as the foremost Kosher Certification body in Australasia, Kosher Australia. A Kosher Certification can be compared to a Quality System or ISO audit and is not a trivial exercise. For a product to gain Kosher Certification its complete Bill of Manufacture must be Kosher Certified including manufactured products purchased as raw materials by a manufacturer. Due to its rigorous nature, Kosher Certification can take months to complete. Fortunately, The Candy Buffet Company is dedicated to delivering this service and has passed all requirements of Kosher Australia. What an amazing buffet! We wanted a “wow” factor at our son’s Kosher Bar Bitzvah and we got it! Our guests all commented on what unusual Kosher Candy you sourced as they had never seen them sold in Melbourne. It is one thing to have a candy buffet with the same old lollies you can buy here, but you wowed us with the wonderful assortment. The table was decorated beautifully and with special attention to the theme of the evening. Claire was extremely helpful with her ideas of the theme and was extremely patient with my constant phone calls ensuring that the night would go off without a hitch – what do you expect from a Bar Mitzvah mum! 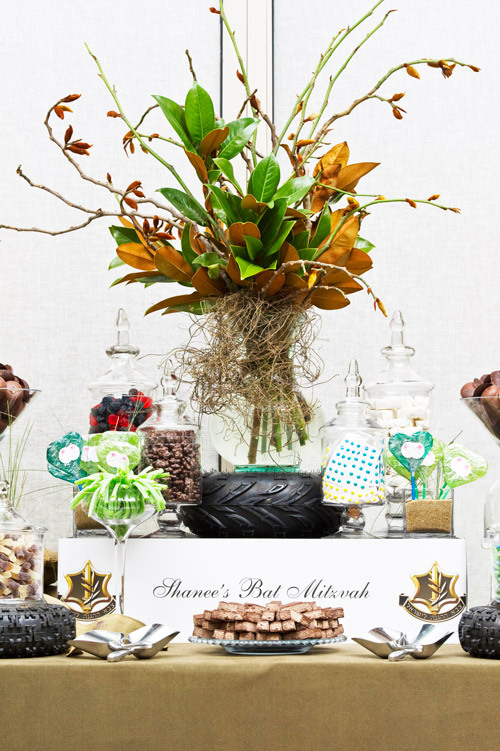 We engaged the service of The Candy Buffet Company for our recent Purim function. What a delight!! They were so helpful and willing to do whatever was needed to make our function a success. They followed all Kosher guidelines and were professional in their approach making sure our function was a success. They accompanied our Japanese theme perfectly. We would highly recommend them to anyone putting on a function who wants to create a beautiful, stunning and unique presentation. It was a truly beautiful and memorable event. Thank you so much. I have been busting to write to you and let you know what an AMAZING Buffet you supplied to us! Your Buffet is still the talking point of our wedding and everyone was impressed! It was defiantly a high light for us on our day.I will not hesitate in recommending your services to all of our friends; a Candy Buffet is now a must at every wedding. Thank you for such a beautiful candy buffet. Such a huge hit. I have never seen such a huge stampede when the candy buffet was announced open! I have nothing but nice words about The Candy Buffet Company and we will be using you again in the future. See more photos in our image gallery.